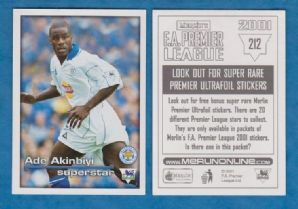 Football sticker issued by Merlin as part of the 2001 Premier League series. Measures approximately 6 x 8.4cm. Depicting the Leicester City and Nigeria footballer Ade Akinbiyi.